Melt the butter in a nonstick pan over medium heat. In a bowl, whisk together eggs and milk (or cream). Season with salt (not much - most smoked salmon is already fairly salty) and pepper. 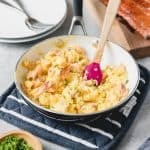 Add the eggs to the pan with the butter and softly scramble, cooking slowly and gently, stirring occasionally with a spatula or wooden spoon until soft curds start to form but eggs are not yet cooked through. Add the smoked salmon and continue to cook, scrambling the eggs and salmon until the eggs are just set and cooked through but still moist and soft. Sprinkle with chives and serve in the pan set on a trivet or transfer to two serving plates.